Presently, VIA Rail Canada service runs from Toronto to Montréal along the North Shore of the St. Lawrence River, and service onward to Québec via the south shore of the St. Lawrence. Service through Ottawa diverges at Brockville and rejoins at Coteau. This proposal would add two new routes to the network - Toronto to Ottawa via Peterborough, and Montréal to Québec via Trois-Rivieres. Modest service improvements would come to the existing routes, but these new routes would be largely free of freight train traffic and excellent service levels could be offered. This would be really good for passengers travelling between the largest cities (Toronto, Ottawa, Montréal and Québec), while still preserving service to medium-sized cities like Kingston and Brockville. This is key, as a seat that turns over at Kingston is a seat that is being paid for twice. This isn't French-style high-speed rail, but given that Q2 2018 was VIA Rail Canada's 17th consecutive quarter of ridership growth, it's clear to me that mega-projects aren't always the right tool to build ridership and shift people onto more sustainable means of travel. If you need to get from, say, Toronto to Windsor - a route I know very well - as fast as possible then flying is an option. There are 4 daily Porter Flights from Billy Bishop, and 4 daily Air Canada Flights from Pearson. The train's strengths are in its ability to serve multiple travel markets in one run. The Toronto - London business traveller, the Woodstock - London - Chatham day-tripper, and the London - Windsor student traveller are all served by one train. All this is in addition to someone going all the way from Toronto to Windsor. Why not play to your strengths? With all that said, there is one issue that needs to be mentioned. The Mount Royal tunnel in Montréal used to be how passenger trains along the north shore of the St. Lawrence accessed Gare Central, but it is being converted to accommodate automated light rail trains. This means that in the interim, north shore VIA Rail trains won't be able to get downtown - passengers will have to change at an uptown station. This will be resolved as we complete the move towards a next-generation signalling system, but this underscores the need for a national transit strategy. As many of you know, I've been getting to know Humber Bay (the Park Lawn and Lake Shore area). Plenty has been written about the transportation issues in the neighbourhood, but my sense of it is that the "GO station will solve all of the problems" is narrow thinking. People aren't automatons who only go to work in the financial district and then come home right after. People have diverse travel needs, and a more comprehensive solution is necessary. Here's a photo essay of a few things that I think would, when bundled together, improve the transportation landscape for people living here. For the last few forevers, there has been no streetcar service west of Roncesvalles Avenue. Passengers wishing to travel further west had to change onto the replacement bus for stops along The Queensway and Lake Shore. For a long time, the bus ran to Queen and Dufferin, then down Dufferin to the CNE. This was really convenient because it could take me to Queen West and to Liberty Village. When they cut it back to Queen and Dufferin it was still convenient because I could at least get to Queen West. Even a replacement bus to Roncesvalles would be convenient because I could change to travel along King, travel along Queen, or travel up Roncy. Standard operations on the Queen streetcar is to split the route in two at Humber Loop so that delays on Queen don't spill over onto Lake Shore. There is plenty of local travel (just a few blocks versus going all the way downtown), so regularly spaced services are probably more important than end-to-end runs. That said, Humber Loop is where it is because it's where the old municipal border was and you had to change to go further. That's not the case anymore, and since there's nothing around Humber Loop it's not a great place to force a change - and neither is Ellis Avenue. Having a one-seat ride everywhere for everyone on transit is unreasonable. That said, forced changes should be carefully designed - ideally, so that they happen at places where people are coming and going in all directions. If we are going to continue to split the Queen streetcar into a Lake Shore segment and a Queen segment, then what I would suggest is to run Lake Shore segment to Dundas West Station. Lake Shore riders would be able to change at Queen and Roncesvalles to continue further along King or Queen, or could stay on to access local shopping on Roncesvalles and the budding transit hub at Dundas West subway / Bloor railway station. Longer term, running the Lake Shore segment to Dufferin and Queen and then down to the CNE is another suggestion. This would provide all of the connections I found useful when the bus took this route and would connect with the future Parkdale / Liberty Village railway station that would stretch from Queen and Dufferin to King and Atlantic. But, new track at Queen and Dufferin would be needed to make this happen. 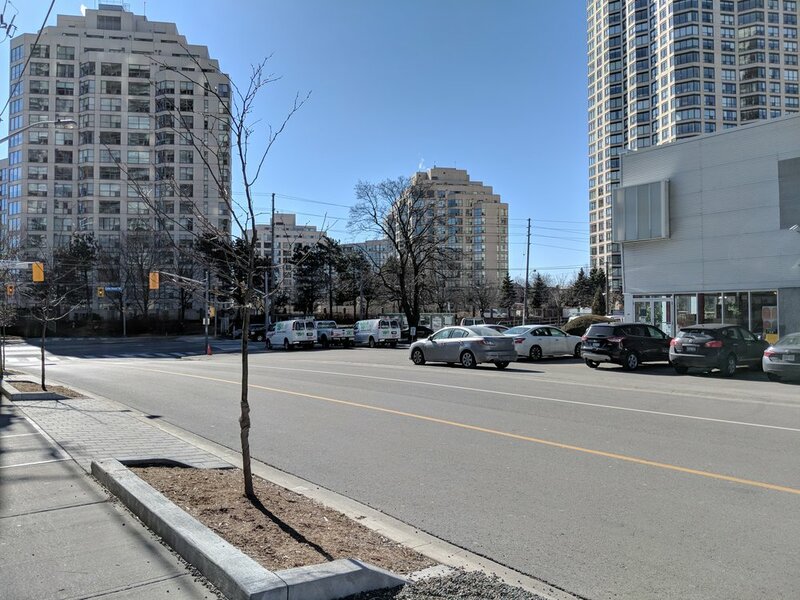 The TTC has proposed to build a streetcar loop at Lake Shore and Legion Road, roughly where the U-haul vehicles are parked in this photo. This would allow the Queen segment of the streetcar to turn around here, meaning that Humber Bay residents would not have to change at Humber Loop in order to travel to Queen West and further downtown. If this happens I would still recommend that Lake Shore segment cars continue eastward into the city. Essentially, no one should be forced to change at Humber Loop! Speaking of Legion Road, currently there is no connection across the railway tracks to connect the Humber Bay side of Legion Road to the Mystic Pointe side of Legion Road. 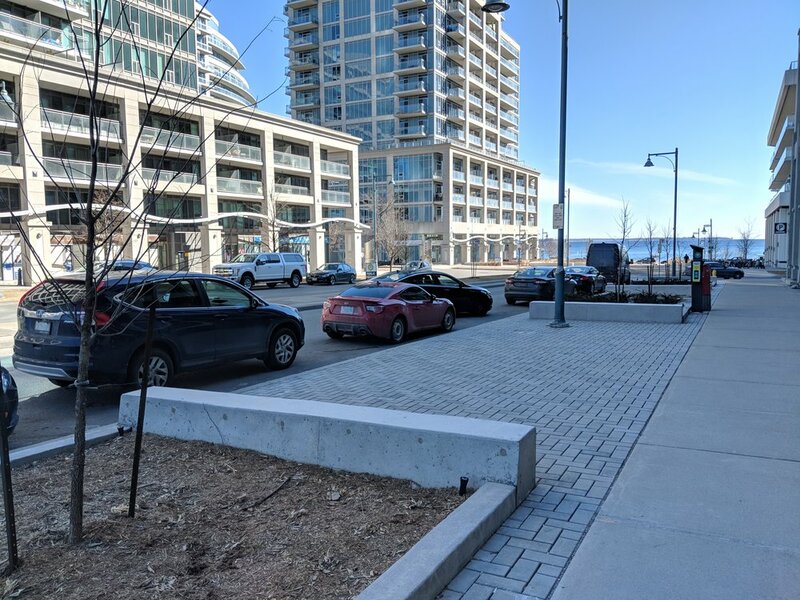 A pedestrian connection, at least, would make for a more useful grid and would improve access to the lake and to east / west transit on Lake Shore. Unlike Mystic Pointe, Humber Bay only has the 66B Prince Edward bus running north and south between the lake and the subway at Old Mill. The Prince Edward bus is the gateway to places like The Kingway and Bloor West Village - both of which have much better shopping options than currently exist in Humber Bay - in addition to any number of places accessible by the Bloor-Danforth subway. Not everyone wants to go downtown, and connections to these areas mean more travel options for people taking transit. - The segment along Prince Edward Drive is of comparably low productivity (few ons and off), with most of the ridership being generated in Humber Bay (at the end of the 66B), at the apartments in the Berry Road & Stephen Drive area (near the end of the 66A), and at Old Mill Station. Routes are most productive when they have ons and offs all along the way so each seat can be occupied by multiple passengers per run. - The low-productivity segment along Prince Edward Drive sees the most service, with each high-ridership residential area only seeing half of the total service offered. If you're going to design a route with a split tail then ideally the higher ridership areas would see the most service. A lot of this routing probably came out of necessity given the incomplete street grid, so let me switch from a problem-identifier to a solution-maker. I would suggest more frequent service, but I would question if the 66A and 66B need to be paired. They each run every 12 minutes during the peak hours (to combine for every 6 minutes along Prince Edward), but would the world end if the 66A ran every 12 minutes and the 66B ran every 6 minutes? Another suggestion would be to run the 66A down to Lake Shore instead of to Humber Loop after serving Stephen Drive. This would give Humber Bay riders access to both branches. Off-peak service is rarely crowded, paritally because service is infrequent. Strategic increases in frequency would help grow ridership and let people truly live a car-free lifestyle. - The trend within the GTA has been to name railway stations after communities. The last three to open were Gormley (not Stouffville Road), West Harbour (not James Street North), and Allandale Waterfront (not Essa Road). - I envision a future where each station could have multiple services using it. Why limit it to just GO trains? The City of Toronto's position is that this station is critical to the transportation future of the neighbourhood. This is true, but they say it as if this will solve all of the neighbourhoods transportation problems. That, as you probably have guessed by the tone of this essay, is probably not true. This station will make travel into the downtown core incredibly convenient, but that is just one of many travel markets that need improved service. GO Transit and Metrolinx's position is that this station would be too close to Mimico station for both to coexist, and they have already decided to spend quite a bit of money to upgrade Mimico. This is true if we are married to the current way GO Transit operates its service. But, what if we weren't? Today, all local trains stop at all stations - so if a train stops at Mimico and it stops at Exhibition then it would have to stop at Humber Bay as a matter of policy. Electric trains might mitigate the increased travel times from adding a new station, but they are not the unicorns of the transportation landscape - slower end-to-end travel times would result (of course if you took that logic to its conclusion then we shouldn't have any stations...). But, what if every other train skipped Mimico for Humber Bay? Or, what if most trains only stopped at the larger, strategically important stations (Port Credit, Oakville, Burlington, Hamilton, etc) and a less frequent stopping service called the smaller stations in between? I'm not advocating one over the other, necessarily, but my point is that the idea that Mimico and Humber Bay are too close together is only an impediment in the "business as usual" scenario. As for the future of the Mr. Christie lands, the community doesn't want more residential - but every neighbourhood ever says this. Some form of mixed-use better than the "technically a Subway in the lobby is mixed use" kind would be nice, as the shopping and food options are good but not nearly plentiful enough. Active transportation in the community is actually pretty good. Bike share now goes as far west as Humber Bay Park East, though I would suggest extending the coverage further west along Lake Shore into the Mimico by the Lake BIA. The Humber Bay Park extends the Martin Goodman trail along the lakefront to Norris Crescent at the west end of the BIA, and a separated bike lane is opening this spring to connect the end of the off-road section with the quiet neighbourhood street section of the Waterfront Trail at First Street. There are also bike lanes on Lake Shore through the core area of Humber Bay, and sharrows on Park Lawn. Upgrading those sharrows to some sort of protected solution to get up to Queensway would be great for network connectivity, as there are a number of designated routes to get to Bloor from there. I didn't really talk about parking because there isn't much to say. There's next to no free parking in the area, and there will never be enough parking of any kind to satisfy everyone. What parking there is should be priced appropriately to encourage people to make good transportation choices, and to allow everyone who wants to drive a fair shot at finding a spot.